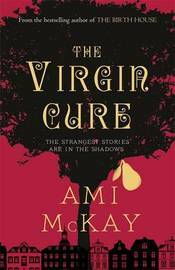 " I am Moth, a girl from the lowest part of Chyrstie Street, born to a slum-house mystic and the man who broke her heart..."
So begins Ami McKay's second historical novel set in the dark streets of New York's lower Manhattan. A world of poverty and hunger, peopled by pickpockets, thieves, beggars and prostitutes and not the best place to raise a young girl. By the time Moth is twelve she is already learning to exploit her femininity in return for food until her mother sells her as a servant to a wealthy woman. Unfortunately Moth's new mistress is a cruel woman who delights in abusing her and this eventually leads her to run away which leads her into the murky depths of the Bowery. She meets Miss Everett, the owner of a brothel known as 'The Infant School' where young girls are trained in the art of charming a man until their virginity is sold to the highest bidder. It is here that Moth is befriended by Dr Sadie, a woman physician who cares for the girls, who teaches her that there are other options and choices she can make that will lead her to a better life. Most of the story is narrated by Moth who is a delightful character, spirited and determined to be independent and sometimes it's hard to remember she is only a child. A different perspective is given through excerpts from Dr Sadie's journal which gives a fascinating glimpse into the life of a 19th century woman doctor. This was so interesting particularly knowing that Sadie was based on the author's great-great grandmother and was the inspiration for writing the book. I loved all the bits and pieces in the margins and at the beginning of chapters- advertisements and snippets from contemporary publications , fashion descriptions and song lyrics - they added so much to creating a wonderfully vivid feeling of the time. Excellent historical fiction - I loved it - even though the harsh realities of life for the lower class masses that the story reveals often make for sad and horrifying reading - and highly recommend! I loved this one too, even if it does sound a bit odd to say I loved a book about training young girls to be prostitutes. Did you ever read McKay's "The Birth House?" It's also marvelous. I haven't read The Birth House but certainly will be very soon. I really want to read this one - I've seen lots of reviews about it but not a single negative one. I'm in the hold list at the library, now to settle down and wait! I was lucky and had my name on the hold list very quickly so didn't have to wait long.